The appeal of the flat-felled seam is that it makes the joint stronger by running two lines of stitches through each piece of fabric, while simultaneously encapsulating the raw edges and preventing them from unraveling. This is the special seam that designers use to create your denim jeans. What’s more, it’s pretty simple once you get the concept. You can make it even easier by running an iron over the seam after you make each fold. 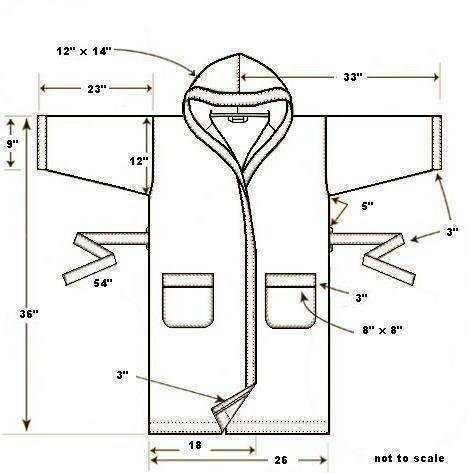 Set it to a low heat so that you don’t scorch your fabric and try making a hooded wrap coat like this one from Mara Hoffman. Use a cozy double-sided winter coating and skip the lining. 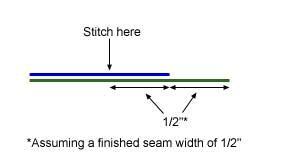 Add a 3-1/2″ hem allowance to the body pattern pieces and appropriate seam allowances for desired size of flat-felled seams (I used 3/4″ for 3/8″ flat-felled). 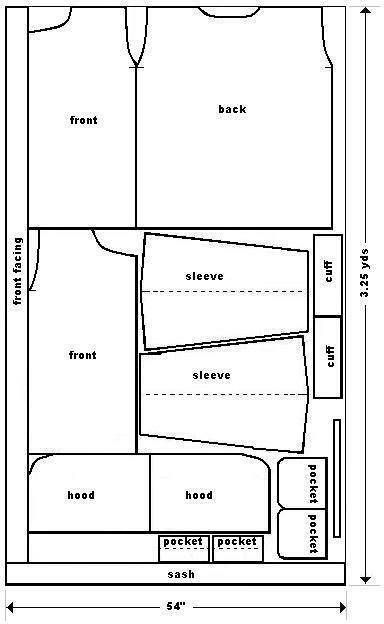 All other seaming can be 1/2″ seam allowance. Layer the pocket placket (right side) to the patch pocket (wrong side) pin/baste and stitch seam. Press seam allowance upward and grade. Turn under 1/2″ seam allowance and press. Aligned pressed edge to machine stitching and topstitch the placket in place. Topstitch the top edge of the pocket. Press under seam allowance on patch pockets and edge stitch on fronts. Join fronts and back at shoulders with RST*. Secure a stay tape on shoulder seams. Double topstitch shoulder seams. Join sleeves to armholes with RST. Grade seam and secure with a stay tape. Double topstitch armscye seams. Fold body and sleeves with WST*. Pin/baste side seams and underarm seam. Stitch seams with a flat-felled seam. Make loop carrier. Cut into 3 equal lengths. Stitch belt loops to side seams 5″ below armholes. Fold the remaining loop at the CB neck and baste in place. Layer hood pieces together with WST. Pin/baste center seam. Stitch center seam with flat-felled seam. Pin/baste hood to neckline with WST. Pin/baste neck seam catching back neck loop. Trim. Sew neck seam with a flat-felled seam. Fold up hem 3″ and topstitch. Fold cuffs in half RST and sew up short ends. Press open. Pin/baste cuffs (RSU) to sleeves (WSU). Sew sleeve cuff opening. Grade seam and press seam allowance towards cuff. Turn under 1/2″ on cuff and align turn with machine-stitching. Topstitch the cuff seam. Topstitch cuff edges. Pin/baste front placket to front edges and hood with WST. Sew placket to coat using 1/2″ seam allowance. Grade seam and press towards placket. Turn up short ends of placket and turn under 1/2″ of placket. Press. Align pressed edge to machine-stitch and topstitch. Topstitch placket edge. Press under 1/2″ on short ends of sash. Fold sash in half (RST) lengthwise and stitch the long seam. Grade. Turn sash right side out and press flat. Topstitch around perimeter. To begin, lay one piece of fabric on top of the other. The bottom piece of fabric should extend beyond the upper piece by the width of the seam (the seam-to-be, that is). Sew a line of stitching in from the edge of the top piece by the width of the seam. Flip the bottom piece out from underneath so that both are lying flat on the table and the extra flap sticks up in the air. Fold the longer flap down over the short one and then fold both of them down flat, as shown. Sew a line of stitches to hold down the flap. When you sew this second row of stitches, be sure to gently pull the two pieces of fabric taut and press the overlap flat as you feed it through the sewing machine. This will result in a cleaner and stronger seam. This is just like a coat I made many, many years ago. I got many compliments everyday and lots of people wanted to know where they could buy one. Mine was shorter but very similar. It was a great coat. When I got tired of it and gave it away the woman I gave it to thanked me over and over many times.